On Jan. 30, 1933, Adolf Hitler was elected Chancellor of Germany, and for the Jewish family of Alice Kraus, life as they knew it in Germany was coming to an end. Kraus, who was born two years later in 1935, would eventually survive the Holocaust by escaping Germany with her parents around the start of World War II, and it was that story of survival she shared with students at Mt. Laurel’s Hartford School on May 19. Kraus began her story with the election of Hitler as German Chancellor and the enactment of The Nuremberg Laws of 1935 where German Jews were stripped of their citizenship and basic rights. Kraus went on to describe the “Night of Broken Glass” attack against Jews on Nov. 9 and Nov. 10 in 1938 where tens of thousands of German Jews and Jewish businessmen were arrested and incarcerated in Nazi concentration camps, including Kraus’ father who owned a men’s clothing store. Kraus said her father and some of his fellow inmates eventually decided to attempt an escape from the camp, and so one day while only two guards escorted them out of the camp for work detail, the men ran from their captors, including Kraus’ father who hid in a ditch until nightfall. Once Kraus’ father returned to his family, he was urged to leave Germany by his brother who had been living in the United States since 1927, and so Kraus’ father traveled to Cuba and waited for eight months until immigration quotas had opened to where he could enter the USA. Kraus said she and her mother waited in Germany, as the Germans weren’t harming women and children at the time, until her father settled in the United States. It was the spring of 1940 when Kraus and her mother traveled to the United States, from Germany to Moscow, to Siberia, to Manchuria, China, back to Russia, to Japan, then leaving Japan on a freighter that stopped in Hawaii before finally reaching the Angel Island Immigration Station in California. When a student asked why the rest of Kraus’ family chose to stay in Germany, Kraus told the students that many had businesses and homes like she and her parents, and the other members of her family thought they were “crazy” to leave. “They thought … why were we going, it was going to blow over, there wasn’t going to be anything worse happening, we just had to lay low for a while, and that’s not what happened,” Kraus said. Once Kraus and her mother made it to America, the family eventually settled in Indianapolis where she grew up and where her father opened a jewelry store. Kraus told the students her people were “guilty of no crime except that they existed,” and she said she wanted to impart to them and others the simple lesson that they should treat others the way they want to be treated. 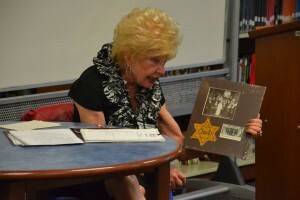 To truly drive home the reality of Holocaust, Kraus was also able to show students the actual Star of David badge worn by her grandmother who was murdered in a Nazi concentration camp. “I kept it as a reminder, not for me, because I will never forget, but for my children and grandchildren so they would know what happened to their people,” Kraus said.